Bee packages consist of 3 pounds of worker bees and a random queen. As they contain no eggs, comb or larvae, it takes 21 days for the first new bee to be produced from the colony. As such the colony is very vulnerable during this time. Feeding is one of the only variables over which the keeper has utmost control. Until flowers are blooming and nectar is flowing, the new installation of packaged bees needs to be fed. Like everything else in beekeeping, there is not an agreed upon recipe for syrup. 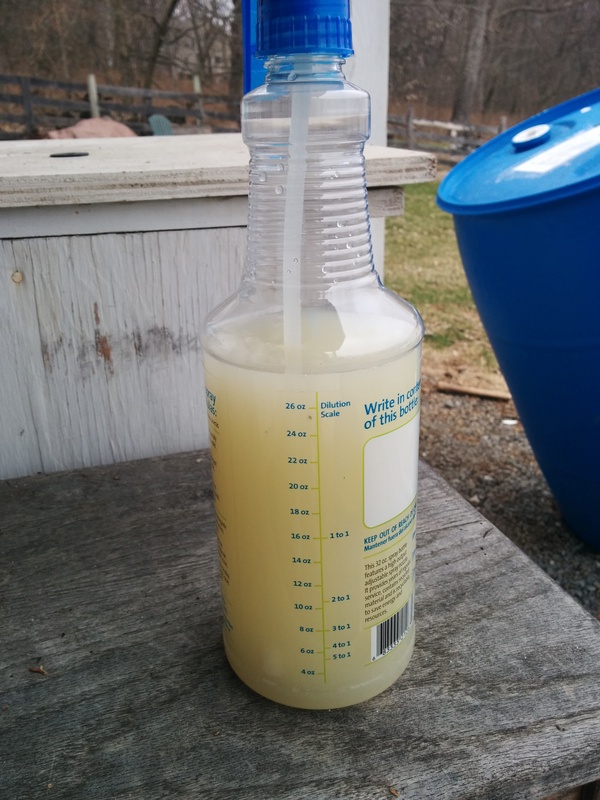 Many sources state that feeding a 2:1 sugar to water syrup in the spring encourages brood production. Others state that 1:1 syrup simulates nectar flow telling the hive it is spring which encourages brood production anyway. I’d leave it to the employees of the beekeeping shop to cast the deciding vote when I picked up my bees. Guess what? The owner said 2:1 and one of the teachers said many books are now recommending 1:1. That reminded me that it doesn’t matter and we love to overanalyze. As long as the bees are getting nourishment and hydration, any further micro-optimization would see slight differences if any in hive health that would not justify the increase of stress in planning. So I designed my recipe to be easy. Really easy. Syrup leaves a sticky residue that is almost impossible to clean on anything it touches. Therefore this recipe is designed so the only tools that touch the syrup are the storage container and the stirrer. Needless to say, do any mixing and pouring outside! You’ll see that my recipe has a ratio of 1 : 1.5625, nicely down the middle of the road. It also uses Honey-B-Healthy which is just an essential oil mixture that can be easily replicated at home. I’ll post on that in the future. Stove and pot to heat water. Pour in some of the sugar. Place lid on bucket and be careful not to spill the sticky syrup on anything! I have 2 top feeders that contain a capacity of 2 gallons. This recipe fills both of them to the brim. On the first night after installing the package, each colony had consumed half of their initial feeding. Therefore I am comfortable stating that this recipe will be enough to feed a single colony for 4 days during establishment, and much much longer after the bees have restored their energy levels after the traumatic travel experience. How you feed it to the bees determines how often you’ll have to fill your feeder! You would likely be able to cut down on the stirring required by dissolving the sugar into the water being warmed in the pots on the stove. 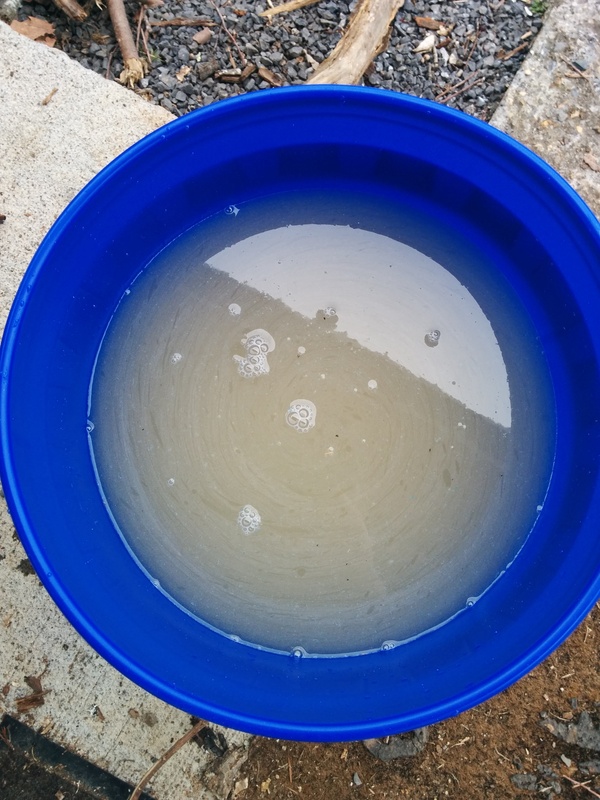 However this brings this messy, sticky process inside and greatly increases the cleanup opposed to when the pots only touch water. I prefer keeping everything outside even if it means I must extensively stir. New beekeepers, I hope you benefit from this. It is very easy to start a colony! 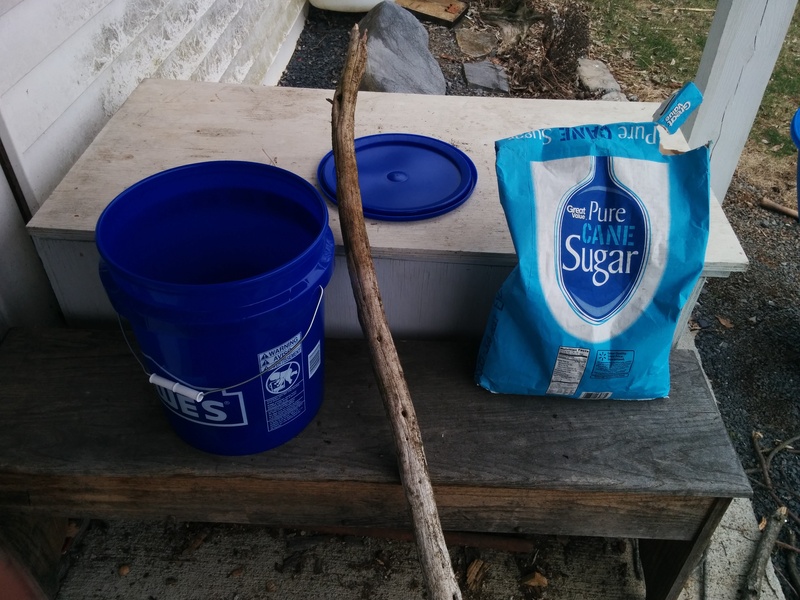 This syrup takes less than 10 minutes, has no cleanup, uses exactly 1 bag of sugar, maximizes the space in a 5 gallon bucket and is mixed right in its storage container. I’ll post an essential oil recipe in the future! Stay tuned. ← The farm is on facebook!